Tweed Valley Lodge is a 4 star **** RAC rated property offering truly unique but affordable adult accommodation with spacious, beautifully appointed suites (all bedding, linen and bath towels are provided). Eight deluxe suites (with a choice of king, queen or twin bed configuration) offer reverse cycle airconditioning and are fully insulated for all seasons including double glazing, wall, ceiling and floor insulation, making the suites lovely and cool in the summer and cosy and warm in the winter. All suites overlook the picturesque Blackwood River just 40 meters away. You can relax with a refreshing beverage and watch the sun go down, then stay on to dine under the stars on your verandah or on the expansive deck where BBQ and dining facilities are provided. The deck affords a magnificent panoramic view of this riverside property. Daily bird feeding and bathing is a highlight with a multitude of parrots and other species providing a continuous flow of traffic along a corridor of bird feeders. 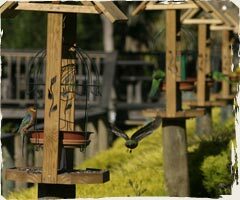 View images and video of our regular bird visitors. Please note the Lodge has been purpose built for that tranquil adult getaway and does not cater for children or pets. Smoking is not permitted inside the rooms for the comfort of future guests. Get current availability, obtain a quote and/or make a booking.